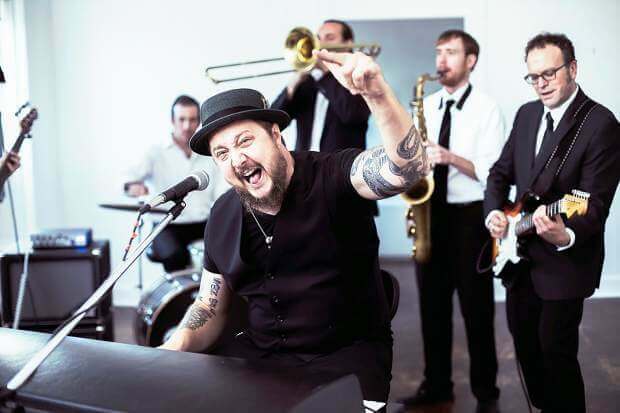 This is a big weekend for live music with local R&B/soul/funk/blues act Josh Hoyer & Soul Colossal hitting Lincoln and Omaha for CD release events for their brand new disc Running From Love (Silver Street). Hard touring over the last year found the band sharing their big, soulful, brassy and funky sound on stages in 32 states. Their dedication to their craft has paid off with Hoyer’s best work yet, showcasing impressive songwriting and heart-drenched vocal chops that continue to evolve in power and grit. In 2015, the band caught the interest of Ken Coomer (Wilco, Uncle Tupelo) who produced Running From Love in Nashville at the Sound Emporium last fall. Highlights include Hoyer’s ballad “Parts of a Man.” The tune is a shimmering, simmering celebration of love, dedicated to Hoyer’s wife Sarah. The lyrics are poetic and the hypnotic grooves the band puts behind the song make it a mesmerizing cut with a beauty and depth that demands multiple plays. The disc delivers plenty of the up-tempo, soul-shouter material that Hoyer is known for including the stomping, in your face “Soul Mechanic” and hard-driving “Knockout” and Hoyer’s impassioned call to unity on the propulsive title track. Preview “Soul Mechanic” here. Keep up with the latest on the band at joshhoyer.com. Catch Josh Hoyer & Soul Colossal in what are becoming all too rare local shows this weekend in support of the new release. Friday, April 1, 9 p.m., the band revs up Lincoln’s Bourbon Theatre with DJ Relic and Chicago band Hood Smoke. The Omaha CD release show at Slowdown Saturday, April 2, 9 p.m. features Satchel Grande and Rothsteen along with JH&SC. Meanwhile over at The 21st Saloon, the funky-blues of Ghost Town Blues Band holds down the weekly Thursday blues matinee March 31, 6-9 p.m. The band has deep Memphis roots and was a Blues Blast Music Awards 2015 Nominee for “Best Blues Band” and 2014 International Blues Challenge Runner-up. Living Blues Magazine says, “GTBB shows what can happen when the past is distilled through young sensibilities, voices, and instruments. This is 21st century blues at its best.” See ghosttownbluesband.com. Down in Lincoln at The Zoo Bar, dance-floor-filling favorites The Bel Airs take the stage Friday, April 1, 9 p.m. and Saturday, April 2, 6 p.m. The Mezcal Brothers take the stage for the 5 p.m. “Friday Afternoon Club” show. In other Zoo Bar news, the Zoo now presents the long-running live band Karaoke show that Sh*thook has hosted for many years around the corner at Duffy’s. Now they bring the party to the Zoo Bar, 9 p.m. every Thursday beginning April 14, no cover. Get ready for Eddy “The Chief” Clearwater, a Chicago blues original next Wednesday, April 6, at the Zoo and Thursday, April 7, at The 21st Saloon. Both shows 6-9 p.m. Clearwater will be inducted into the Blues Foundation’s Blues Hall of Fame on May 5 in Memphis as part of the 37th annual Blues Music Awards. He is being inducted this year alongside Elvin Bishop, Jimmy Johnson, John Mayall and the Memphis Jug Band. See blues.org/2016/02/2016-blues-hall-of-fame-inductees. Clearwater is known as one of the best players of the classic West Side Chicago blues sound. Take the time to see this legend while he’s at local venues next week. See eddyclearwater.com. Check out the April print issue of The Reader for the monthly Hoodoo that includes the Playing With Fire artist announcements for 2016. The shows will be at Midtown Crossing again this year but move to Saturday, July 2, and Saturday, Aug. 27.